Vodafone is always known for its eye-catching design and always puts emphasis on what gives users the best in terms of peace of mind and comfort, of course. The newly announced Vodafone Smart E9 in India is indeed hot and shouting smartphone as it’s released in the month of November 2018. Comes with 4G Technology but it’s not as great as one would want. Let’s find out more below! The handset runs on (Go Edition) Android 8.1 Oreo operating system and houses a gorgeous 5-inches TFT LCD screen with a maximum resolution of 960 x 480 Pixels at 215 PPI Density. The handset is available in Anthracite with the support of 2G, 3G, and 4G LTE network. It’s boasting a 5MP rear sensor with so many features such as Geo-Tagging, Touch Focus, Face Detection, and HDR and out front, you will see a 2MP camera for selfies and video calls. The brain behind Vodafone Smart E9 is MediaTek MT6739 435 Chipset and PowerVR GE8100 GPU coupled with 1GB of RAM and 8GB of onboard memory which can be expanded further up to 32GB with a help of microSD card. 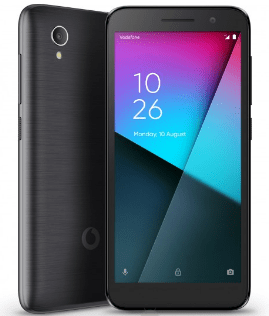 Other Vodafone Smart E9 specifications include 2000mAh non-removable battery with no wireless and fast charging support, Bluetooth 4.0 A2DP and a standard 3.5 mm headphone jack. The Vodafone Smart E9 Price in India starts from INR 4999 – 5499 but it varies from store to store. The handset has now officially been announced and hitting shelves all across India which means the audience can get their hands on one immediately. One will have no option to pick it up in a choice of any color as it’s coming in Anthracite color only.